BASILE IKOUEBE, Minister for Foreign Affairs and the Francophonie of Congo, reiterated his country’s support for South Sudan and his Government’s commitment to develop close friendly relations with it. It was time for the Palestinian people to realize their political aspirations to have a sovereign State that was a full United Nations Member, living in peace with Israel. The restoration of peace and security in Libya must be a major priority. He supported the United Nations Support Mission in Libya. Congo and other members of the African Union’s ad hoc committee aimed at finding a peaceful solution to the Libyan crisis urged the National Transitional Council to fulfil its commitment to preserve national unity and engage with all of Libya’s political parties to rebuild the country and protect foreigners, particularly African migrant workers, as well as open an inclusive political process to definitively settle the crisis. He expressed hope that Cameroon’s upcoming major elections would be conducted smoothly. He encouraged the Transitional Federal Government in Somalia to continue efforts within the framework of the Djibouti Agreement to bring about peace. He called on all concerned parties to renounce violence. 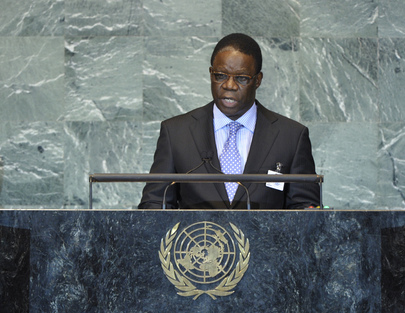 He lauded the wave of international solidarity towards the Horn of Africa. In that spirit, Congo had donated funds to assist the victims of drought in Somalia. Mediation was essential for peacefully settling disputes and resolving conflict. Africa was replete with lessons in that regard. More than ever, mediation was the only way to ensure lasting peace. The use of force should be a last resort, and the Security Council should strictly outline the conditions in which that was sanctioned to avoid any manipulation or deviation. Exploiting the global justice system was dangerous, particularly in Africa, and must be prevented. The Organization must adapt to new global realities in order to be effective and legitimate. In that, United Nations reform was urgent, including restoring the Assembly’s central role and promoting participation of the broadest number of countries in decision-making. He called for the successful conclusion of negotiations on a post-Kyoto agreement. The upcoming Durban Conference on Climate Change must produce an international instrument open for signature before the start of the Rio+20 Conference in 2012. In Central Africa, the countries of the Congo basin forest were working to achieve sustainable forestry and good forest governance, end illegal logging and implement the REDD+ processes. The international community should support that effort to reduce global greenhouse gases. During a conference in May and June in Congo, the Congo basin forest countries, the Amazon basin countries and South-East Asian countries, with the support of relevant United Nations agencies and other partners, had drafted a cooperation agreement, which would be signed during the Rio+20 Conference. Sustainable forestry management required substantial human, material and financial resources, which developing countries often lacked, he said. He called urgently for the release of “fast start” funds promised by developed nations, innovative financing and technology transfer to the developing world. He paid tribute to Wangari Maathai, who had been a Goodwill Ambassador for the Congo Basin Forest. The sweeping political changes in the Arab world were replete with lessons for the international community, as had been the changes in Eastern Europe following the fall of the Berlin Wall. Liberty and democracy could not be imposed from outside. It was necessary to face the new geopolitical challenges that had promoted the emergence of new international forces.